A while back someone asked me what I like to do with my free time, and it took me a second to come up with an answer that was simply about me. Before having kids, I loved going on long walks, cooking, reading a book (often in just a day), learning, and going to movies. Since having kids, I’ve read three books in five years, I rarely cook something other than the necessary dinner cooking, and I can count on one hand the number of movies I’ve seen in a theater since Shiri was born. And I don’t remember the last time I stayed awake through a movie at home. About the only thing I still do for me alone anymore is long walks. Those are essential. When the world around us gets busy, and life starts to consume us, sometimes we have to let go of pieces of ourselves in order to continue growing. Our Torah portion this week, Parshat Vayishlach, reminds us of what it might be like to live fully as yourself, even as the world around you is changing. 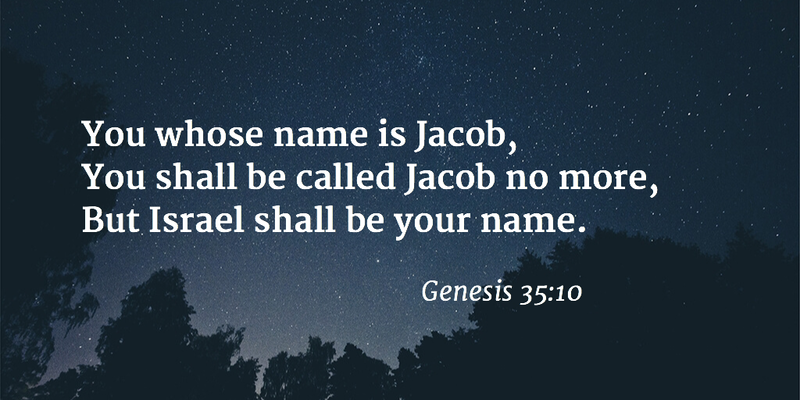 Jacob is preparing to meet his brother Esau after their fallout and struggles in his dream with the angel who changes his name to Israel. The brothers meet and part in peace, and the story continues with the birth of more sons to Jacob and the different ways in which his children misbehave. But before all the fun begins, Jacob has a realization about his character while living with Laban. There are so many ways in which our interactions in the world are influenced by those around us. From the ways in which we behave day to day to the hobbies we take on, we are influenced by our status in life, and the relationships in which we find ourselves. When we’re around people who make bad choices, we’re often more likely to do the same. But, when we surround ourselves with positive role models, we may follow suit. What can be difficult is choosing to do the right thing, even when depravity seems to surround us. As Hillel teaches in Pirkei Avot, “In a place where there are no people, strive to be a person.” May we all be like Jacob, hold true to ourselves, our values, our core beliefs, and may we help others to shine out in the world around us. Seemingly incompatible temperaments can work together. My husband Duncan and I are a prime example of this. We could not be more different when it comes to our emotional response and tolerance. We compare ourselves to the way different materials react to heat. I tend to be like aluminum: I get frustrated very easily, but then I usually calm down and relax very quickly. I don’t hold on to my frustration for long periods, except on rare occasions. On the other hand, Duncan is like glass: he’s very patient, and it takes a lot of heat to really frustrate him and get him to combust, but once he’s there, it takes just as long if not longer for him to cool down. This means that when we have a disagreement, we’re often on opposite sides of the emotional spectrum. I’m already on my way to cooled off as he’s just reached his hottest point. I’m ready to forgive as he’s ready to blaze. In our Torah portion for this week, Parshat Vayishlach, we read about Jacob preparing for his meeting with his brother Esau after their estrangement. Jacob struggles with an angel during his dream before their meeting, and then their meeting is uneventful. Jacob and Esau meet, they hug, they forgive, and they move on. The parshah ends with Jacob’s daughter Dinah having an incident in Shechem and a list of the final events in the life of his family before the Joseph storyline begins. Earlier in our story, Jacob and Esau anger each other, they have some time apart, and in the buildup to this moment it appears that Jacob is not so sure whether his brother is glass or aluminum, whether he is ready to forgive or might need some more time. These twins are clearly as different as siblings get, and Jacob is fearful of a war being waged, so he prepares himself physically by separating his children to avoid mass casualties. His restless behavior shows his distress. Is he himself ready to forgive? Perhaps he’s not so sure of that either. It turns out they were both ready to forgive. The brothers meet, they run to each other and embrace, and they forgive and move forward. Yes, for the time in between they carried the grudge, the fear, the concern with them, and it clearly messed with Jacob’s psyche, manifested in his crazy dreams. But in the end, it was family that really mattered to them. These brothers carried around a lot of baggage leading up to this point. Their family dynamic changed dramatically when Jacob won the birthright, and then again when their parents picked favorites. They were estranged as they entered into adulthood. There was no obvious reason to forgive, but they discovered forgiveness simply felt right and helped them let go of the burden they carried for so long. Vayishlach means “and he sent.” What is being sent away is not a person or an object, but rather anger and fear. The emotional baggage is being discarded in favor of love. Oddly enough, the more we can learn to let go of certain things, the more we can hold on to each other. The Bible is a kissing book. Who knew? In fact, kissing in the Bible serves a significant purpose, and it’s not always a romantic one. This week’s parshah, Vayishlach, again shows us interaction between Jacob and his brother Esau. The last time these two were together, Esau didn’t seem too attached to his birthright blessing until it had been given to Jacob, and Jacob didn’t care much about his brother’s right to the blessing until his brother threatened to kill him. Now, twenty years or so later, we find the brothers on a path to meet again. Both are now married and fathers of large clans, and both have large flocks with them. When the brothers are reunited there is a scene that, on the surface, appears to be a straightforward reconciliation between two estranged brothers. They hug, they kiss, they move on. But anyone who is familiar with sibling relationships knows that this is no ordinary reconciliation. After all, Esau is usually looking out for himself and no one else, and his actions are almost always motivated by hatred. To see him kiss and hug his brother as only a close family member would feels foreign based on previous passages in the Torah. Shiri loves to give silly kisses. At bedtime we used to go through at least a dozen different silly kisses before she’d finally agree to go to her crib. There was the tiny kiss, the baby kiss, the monster kiss, the pineapple kiss (not even the silliest one, believe me). Each one had some different noise or expression that went with it, and you can bet Shiri would let me know if I did the expression wrong. Clearly kisses can mean a variety of things, so what did the kiss between Jacob and Esau mean? Was it simply an act of fraternal love, or was it shallow and conciliatory and just for show? Certainly this is one of those Torah portions that asks us to draw our own conclusions. Kisses from mother to daughter, from spouse to spouse, and from sibling to sibling are all very different, even without the baggage that Jacob and Esau brought to their reunion. So perhaps the meaning, like the gesture itself, is to remain between two people and two people alone. Good luck will rub off when I shake hands with you. Or blow me a kiss, and that’s lucky too. –“Chim Chim Cheree” from Mary Poppins. Truly life-changing moments are few and far between. A specific encounter can touch your heart, or a story on the news can make you think, but very few of these moments reach us so deeply that our lives are never the same again. The instances that typically alter our lives are the ones you’d expect, like significant lifecycle events or major traumatic experiences. However, occasionally an event which seems superficially insignificant can lead to an unexpected transformation. This is the case in parshat Vayishlach, which we read this week. The portion is filled with what should have been huge, life-changing moments for Jacob. Jacob and his twin Esau reunite and make up after a 20-year estrangement. Following this, Jacob’s daughter Dinah is involved in a violent incident in Shechem that prompts her brothers to take revenge on her behalf, Rachel dies in childbirth, and Jacob’s father Isaac dies. All of these significant events likely impact Jacob in one way or another, but it’s before these at the beginning of the parshah when his life is changed completely. When Jacob and Esau reunite, Jacob is overcome with emotion. In Chapter 33, verse 10, Jacob proclaims, “Seeing your face is like seeing the face of God.” The text in Genesis Rabbah, a 5th century commentary on the Torah, suggests that Jacob is talking about his own transformation, not about his brother’s appearance. Jacob is sharing with Esau that he has seen the face of God and is a changed man, not the deceitful brother who tricked his twin. He no longer sees Esau as a rival, but as an equal, deserving of honor and dignity. Clearly Jacob is a new person. It’s a cliché to simply say “people can change.” Our parshah reminds us that change is really about having our perspective shifted so that we may see the world differently. The hope is that we recognize in ourselves not only these significant moments when they happen, but the potential for them to occur at all.